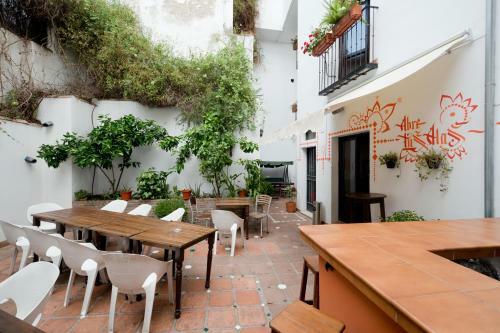 Located in Albaicin, the Oasis Backpackers Hostel Granada is close to Granada Cathedral and offers a 24 hour reception, bicycle rental and a rooftop terrace. The hostel is a five-minute walk from many attractions including the Madrasah of Granada and Royal Chapel of Granada. Facilities at the Oasis Backpackers Hostel Granada include luggage storage, multilingual staff and a tour desk. Wi-Fi is available in the hostel, meaning you won't have a problem remaining connected while on the road. Guests can also benefit from the hostel's garden. The Oasis Backpackers Hostel Granada has 5 comfortable rooms offering all the essentials. Guests can enjoy a gourmet breakfast, which is available on request every morning. In the evening, guests are invited to relax in the hostel's comfortable lounge bar. Situated close to a range of popular hot spots, the hostel is in close proximity to lots of bars, nightclubs and trendy places to eat. The Archaeological Museum of Granada and the Monastery of Saint Jerome are within a short 10 minute walk of the hostel. This hotel is 1223 metres from the Alhambra entrance, 159 metres from Plaza Nueva (the absolute centre of Granada), 1423 metres from the train station and 2828 metres from the bus station.